The place where campers love to come back! Tall Pines Day Camp in Williamstown is a popular summer hot spot, where campers and staff just keep coming back. Parents feel safe and secure leaving their children at Tall Pines, knowing that they will play, learn, laugh and make lifelong friendships and memories. The family-oriented camp, now in its 16th season, is home to 600 campers between the ages of 3 and 14, who enjoy a multitude of activities throughout 66 spacious acres. Close to 80 percent of the kids return every year, a figure that far exceeds the 50 percent national average. The loyal staff—some 300 seasoned professionals—keeps coming back, too. “Most of my staff grows up here, and if the staff is happy, they in turn make the kids happy,” points out Andrew Yankowitz, co-owner and director of Tall Pines Day Camp. “The campers are getting returning veterans who have grown up here.” In fact, most CIT’s (counselors in training) have been campers for an average of seven years before becoming counselors. The Adler family, from Cherry Hill, began sending their sons to Tall Pines the very first year it opened, intrigued by what the camp had to offer. “It offered some different programming and we just wanted to take a chance and try it,” recalls Shelley Adler. “We were impressed when we went to an open house.” At the time, two of her kids, ages 7 and 5, attended and loved their experience. Two more sons followed in their brothers’ footsteps, and 16 years later, the youngest is still a Tall Pines camper. Campers can pick and choose from many activities, including age-appropriate programs in sports, nature, computers and the arts. Almost all of the buildings are air-conditioned, keeping kids cool even on the hottest days. There are tons of athletic activities available for kids of all levels and interests. From baseball and softball to archery and golf, there is something for every girl and boy. Kids will try slugball, newcomb and ga-ga, activities their parents probably never even heard of! Because ga-ga is a favorite for many campers, two more ga-ga courts are being covered this off-season to accommodate rainy and sweltering days. Each year, new features are added and venues are renovated. The camp takes great pride in keeping up with new trends and expanding popular programs. Also for next season, swimmers will enjoy newly resurfaced pools. Other recent additions include a brand new playground and additions to the high and low ropes course. Kids will love the brand new high-end pingpong tables, while hockey fans will enjoy the freshly painted roller-hockey rink. As golf has gained popularity among girls and boys alike, Tall Pines also offers a Golf Academy. Experienced pros provide instruction on the driving range, putting green and sand traps, encouraging campers to step up to the tee. For kids more into the arts, Tall Pines offers many excellent programs in the creative and performing arts. For budding actors and actresses, the theater program creates a large-scale production with professional direction to help campers hone their skills. Activities including dance, music, dramatics and singing, introduce kids to new skills. Wood shop, jewelry-making, cartooning and creative crafts, provide enjoyable unique artistic outlets. Kids with an interest in science and nature are encouraged to explore the camp’s dynamic environment. Carefully guided nature activities include fishing, the popular ropes/challenge course and even Native American lore. Kids learn about environmental conservation through their exploration of nature. Of course, technology plays a major role in kids’ lives today, and campers can get their fix in the computer center. Tall Pines make safety a top priority, from the activities to the meals. All kids will learn to swim safely from an aquatic staff comprised of American Red Cross-certified water safety instructors. Lifeguards are trained to be especially sensitive to the needs of swimmers at different levels. Campers enjoy an instructional swim and a free swim every day. With more than a dozen food choices each day, even the pickiest eaters are satisfied. Campers can choose from a variety of kid favorites, including mac-and-cheese and chicken nuggets. Or, if their tastes are more varied, they can have Chinese food or tacos. A healthy salad bar is available daily along with yogurt and fruit bars. For those who just have to have PB&J, they even offer a soy nut alternative. Delicious desserts include fresh fruit, water ice and nut-free brownies. Tall Pines caters activities to each child’s abilities as well as interests. The Seedlings program is geared to the tiny tots, ages 3 and 4, as a half-day program. There is also a full-day program in Junior Camp for those toddlers who are ready for a longer day. Campers can enjoy an array of activities from crafts and cooking, to big wheels and parachute games. Even the youngest campers get instructional swim lessons. There is one staff member for every three children in this age group. Junior campers can take part in all sports and activities, plus, get their own themed weeks. Bug Juice 500 and Field Challenge Day are among the most popular. These kids, preschool through post-kindergarten, are supervised at a ratio of one staff member per four children. Middle campers, who have completed first grade through third grade, enjoy all camp sports and activities, plus, they can choose from 15 additional club program activities. For kids who have completed fourth through sixth grades, scavenger hunts, sport tournaments and bunk challenges are popular programs. Campers come from a 40-mile radius on air-conditioned vans. From Philadelphia to the Jersey shore, as far north as Moorestown and all the way down to Franklinville, campers get to make new friends from all over the region. Tall Pines offers flexible scheduling. Campers can attend for as long as they’d like between three and eight weeks. Working parents enjoy dropping their children off early or picking them up late, all for no extra charge. 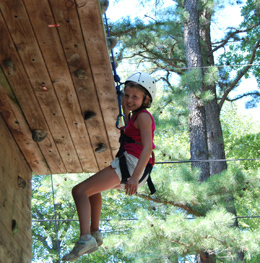 Wiseman feels secure knowing that Tall Pines is a privately owned camp with an experienced staff. Owner and executive director Marvin Domsky brings 55 years of experience and knowledge as owner and director of Willow Grove Summer Day Camp. Yankowitz also enjoyed a 15-year career at Willow Grove and has been director of Tall Pines since it opened in 1996. Roughly 75 percent of senior counselors are state-certified teachers and education majors. “It’s a camp that offers everything you could ever want,” concludes Wiseman.